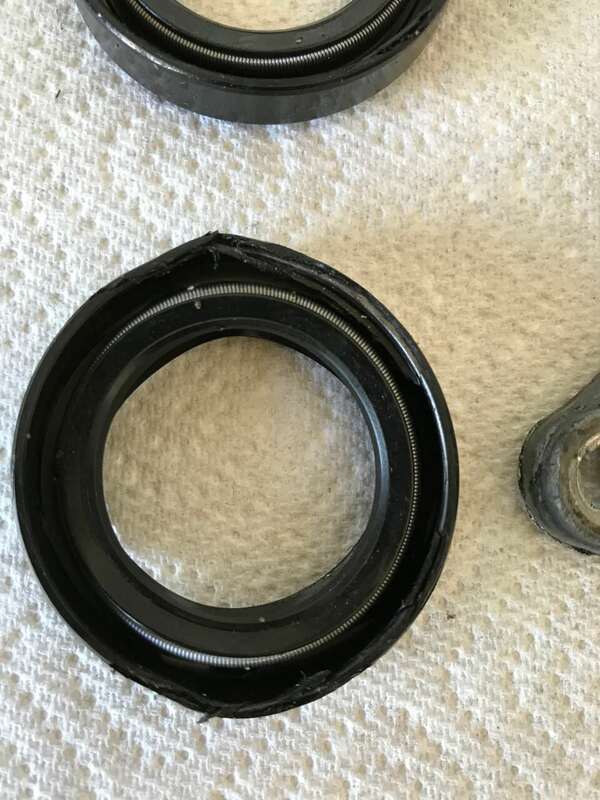 So I wanted to change the oil seal, I ended up taking the whole casing off, however this casing is a bit damaged on the edge. When trying to put new oil seal in it just won’t go, am using a 33mm socket and hammer, all I’m doing is damaging the new seals. Do I need a new plate ? 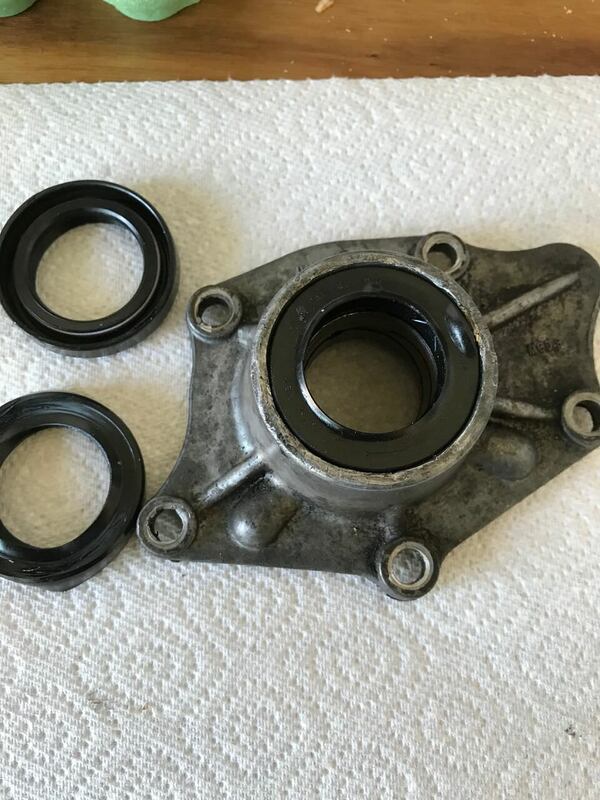 Have I got the wrong seals? I have checked all the mini sites and it says get adu 5738 which I have. The old seal sits in there better than the new ones. Mine seem to be too big to fit in the hole, I’m right totally stuck ! Try cleaning the edge of the recess up so there are no burrs to catch the seal then lubricate it and try pressing it in with a vice. Make sure the back of the housing is protected so it doesn't get damaged and a flat plate over the seal to support it while it's being pressed in. Hard to say from those pics if the flange is damaged, pop a seal out and take a pic of the bore in the flange where the seal fits. I don't use any tools to fit the seals in these. I put the seal on some paper toweling on the bench, spring side up, offer up the flange to the seal and lean hard on the flange (does take some effort) and basically 'press' them in that way. 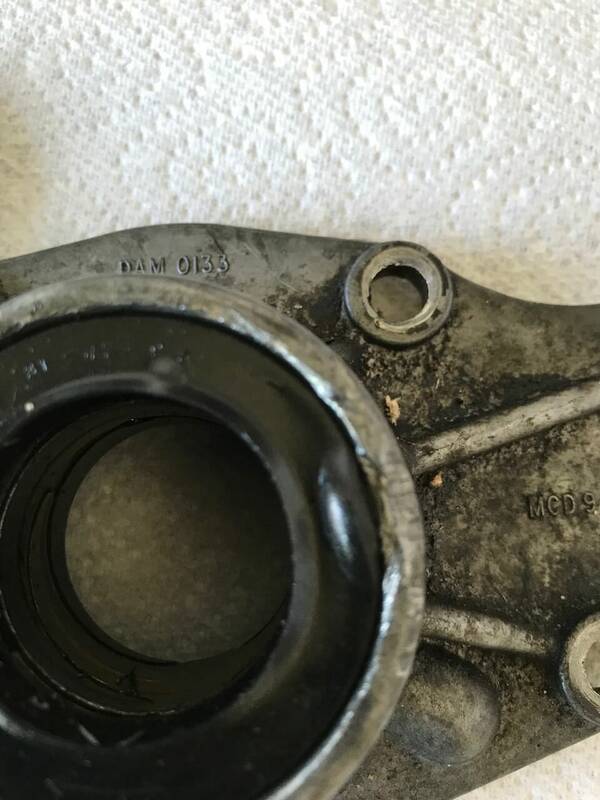 If the seals have two lips, put some grease between the lips before re-fitting the flange to the gearbox. i would be giving that edge a clean it looks a bit mangled. Good clean up of the leading edge, a light smear of rubber grease and should slip in. May be its an after market seal and not quite the correct size. I've found the lubrication and brute force method is the only way I can get any seal in without damaging it. With the housing off the gearbox go with "press the housing over the seal"
For longer than I care to remember, I have used a small cylindrical stone, (a dremmel is a bit small), and ground about a 2MM X 30 degree taper in a housing, to lead the seal in. It takes maybe 5 minutes and probably isn't always needed, but has save a lot of bad language over the years. The elasticity in rubber does not respond well to "shock", much better is steady pressure such as a vice or big G clamp than hammer blows, but if you use a hammer, as soon as you get it started, using a bit of wood as a punch, keep going round the seal with light blows. Just remember relaxing the seals does not always fix a leak, if the bronze bush is worn. Gently file down any burrs that obstruct new seals being fitted. Lubricate the seal before fitting. Shown here are remanufactured ones I produce,with new machined bushes and these have the burrs machined out. Edited by ACDodd, 06 August 2018 - 10:49 AM. Acdodd how much do you sell those for please ?